The sun was out & you sure could tell because the Hammer Time Team was Hot! Hot! Hot! Bid-ness in the Swamp. The approx. 40 acres consisted of flood plain, had no mineral, oil or gas rights & the timber was non-descript. The pre-auction estimate was $40,000 and the Attorney representing the Trustee thought we were kidding when the bidding began at $10,000 and ended at $125,000! He thought we were just "warming up" for the REAL auction but when we stopped and said SOLD the reality sunk in! Bidders had travelled from near & far (Danville & Toledo) & we certainly appreciate the great attendance that day! Recreational Retreat & Outdoor Paradise. Approx. 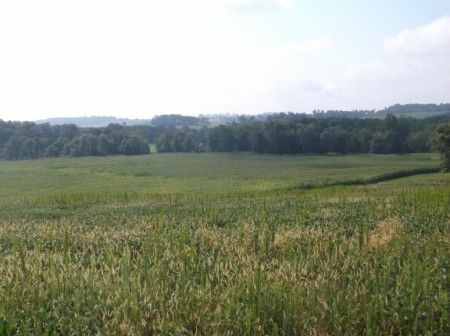 40 acres M/L, Knox Co. Tillable, Woods & Stream. $10,000 Minimum Bid Sold as a Whole! Here’s a very scenic parcel of vacant land situated between Zimmy’s Automotive Repair & KOKOSING GAP Recreational Trails on Carey Lane. The Auditor shows APX. 16.83 Ac. 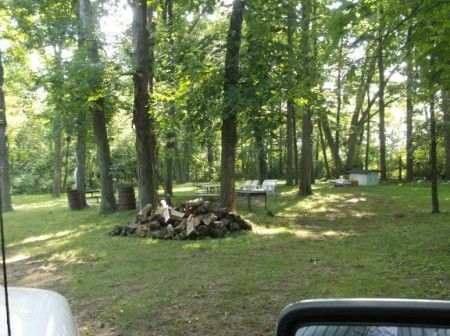 of cropland, balance in woodland of various species of hardwoods, The picturesque Camp Site over looks the stream meandering through the property. Knox County is well known for it’s big deer, abundant wildlife and natural beauty. Real Estate Terms: $10,000 Min. Bid, $5,000. down at time of sale in form of Cash or Check, close on or before May 12, 2014; offered free & clear of liens or mortgages prior to closing. Taxes are prorated to day of closing, ACS Title and Closing Services, 109 East High Street, Mount Vernon, OH 43050 740.393.7777, will be responsible party for Closing. Make your earnest money deposit made payable to Mr. William B. Logan Jr. Trustee. Selling in AS-IS Condition On Site, NO buyer contingencies exist. Selling only surface rights the mineral, oil & gas rights have severed. All information provided is to be utilized only as a guide. Buyers are relying solely on their own independent inspection, inquiry, investigations and due diligence regarding to property. Buyer agrees and understands that the seller and seller’s agent makes no warranties or representations of any kind either expressed or implied as to the condition, quality, and merchantability or fitness for a particular purpose for the real estate or any part thereof and/or serviceability for the same. This agreement is solely between buyer & seller. Stanley & Son, Inc. and its agents are exclusive agents for the seller. Any announcements made only by the auctioneer from the podium during the time of auction will take precedence over any previously printed material and/or any other oral statements made or implied. No liability exists regarding the information contained in any printed matter for its accuracy, errors or omissions. Bidding is open, just call out, raise your hand or watch the ring personnel. Taxes & Legal: Court ordered US Bankruptcy Case #12-53076 Southern District of Ohio Eastern Division; John Philip Shults, Loretta Lucille Shults Debtors, this property will be sold on the premises.